To download image, right click on image, then navigate to 'Save Picture As' to save this file to your computer. To download digital audio files of this story, right click here, then navigate to "Save Target As" to save this file to your computer. CLIVE, Iowa — A Des Moines man purchased a few lottery tickets on his lunch break and scratched off a $50,000 prize. 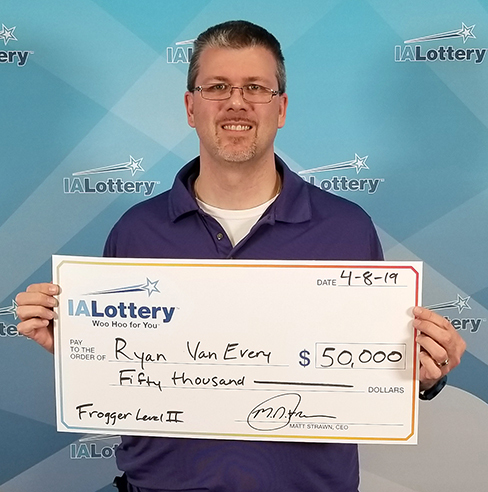 Ryan Van Every, 39, won the fifth of 10 top prizes available in the Iowa Lottery's "Frogger Level II" scratch game. He purchased his tickets at Hy-Vee, 4605 Fleur Drive in Des Moines. He scratched them at his desk before his break ended, and was shocked when the second ticket revealed a $50,000 prize. "I was a little surprised, a little dumbstruck," Van Every told officials on Monday as he claimed his prize at lottery headquarters in Clive. "That's when I called my coworkers over just to double-check for me because I thought maybe I made a mistake, because I've never won more than $50 on a ticket. It was a big surprise." Van Every, a promotions producer at KDSM-TV in Des Moines, texted his wife, Julie, with the news as his coworkers checked the ticket and confirmed his big win. He said he plans to use his winnings to eliminate debt and make some home improvements. Frogger Level II is a $5 scratch game that features three ways to win and overall odds of 1 in 3.5. For more information about this game, and the number of prizes still available, visit www.ialottery.com.